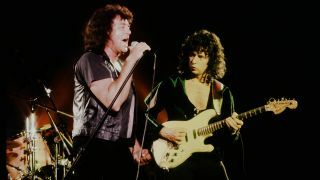 Ian Gillan says it’s now “too late” for Ritchie Blackmore to appear again onstage with Deep Purple. Blackmore left the band for the final time in 1993 but reported last summer that he was open to the idea of playing one more show with Purple “for old times” but admitted it was unlikely to happen. And in a recent interview, the subject again arose – but Gillan ruled out the possibility. He tells Radio Rock: “Let me give you an example. Say you were divorced and there was acrimony and difficulty and lots of relatives and children were affected, and life went on. “Then you got married again and someone says, ‘We want you to get together with your old wife, and your new wife, all together, and we're going to have a wonderful time.' Can you imagine how difficult that is in human terms? Gillan adds: “Everyone knows the history. Purple was on the downslope when Ritchie left, and with Steve Morse, we got back on the upslope again. Gillan reports he and the band’s relationship with Blackmore is cordial, saying: “We have no great passion or dislike for Ritchie – we're actually exchanging communications and ideas through our offices, so there's no nasty feelings left. But I think it's too late. We're thinking about the end now. “The other thing is it would just open the damn gates and all this whole damn thing would start all over again just when we put it to bed. “As far as I know, everybody in the band would think that was a bad idea. Let's just let it rest. Let's just wish Ritchie well, and do what he does, and we'll do what we do. Things are going along very nicely now." Deep Purple are currently on The Long Goodbye tour in support of their latest album Infinite, which was released last year.